Curdnatta Photographers - "Patterns in Nature"
The Theme for the Curdnatta Photographers in October was "Patterns in Nature". Initially I wondered if I would be travelling over familiar territory as I already have so many images of nature's designs, some of which I have used in my textile works however by concentrating on the actual pattern and using black and white I found a wonderful new world of design... I think I am hooked !!! I'll definitely continue to add to my collection and no doubt some of the results will end up for sale in the Curdnatta Gallery. 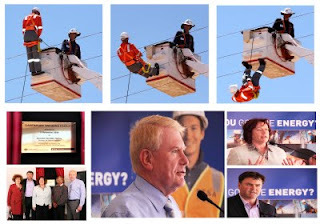 I have provided images for ETSA (Electricity Trust of South Australia)Utilities several times now. The latest event being the opening of the Technical Training Facility by Senator Annette Hurley, Senator for South Australia, Australian Labor Party. The Technical Training Centre at Davenport (near Port Augusta) is a major initiative by ETSA Utilities. The facility complements theAdelaide training centre and provides apprentice and refresher training forthe northern based workforce. It also provides training opportunities in the electrical field for local Year 11-12 students, increases trade training opportunities for Aboriginal people, and improves services in the northern part of South Australia.